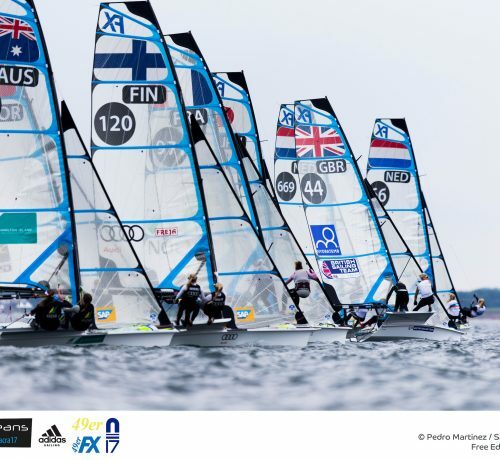 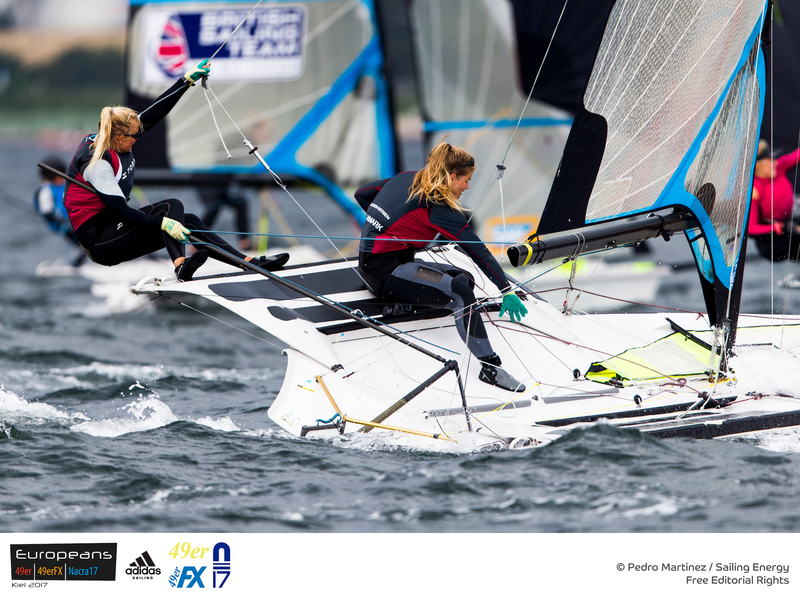 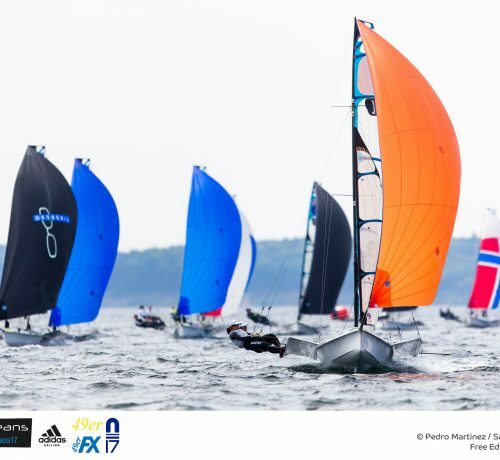 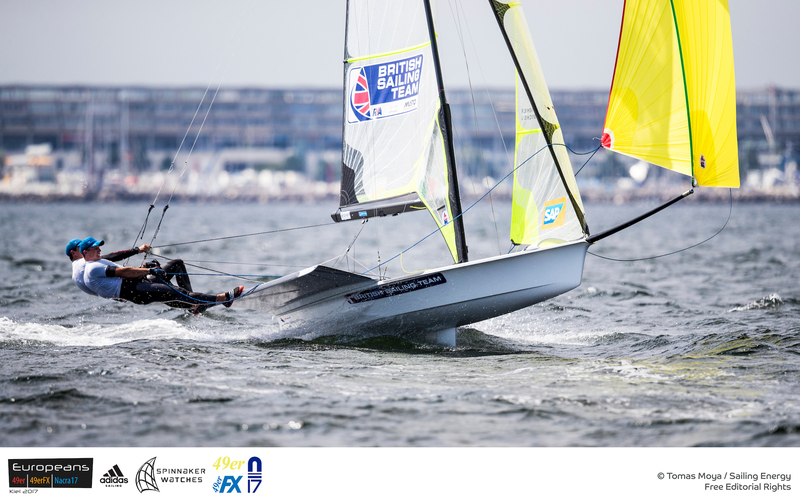 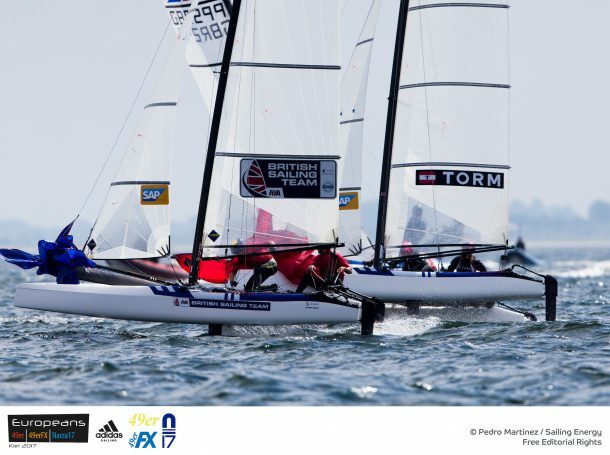 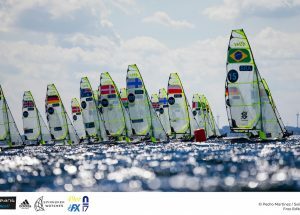 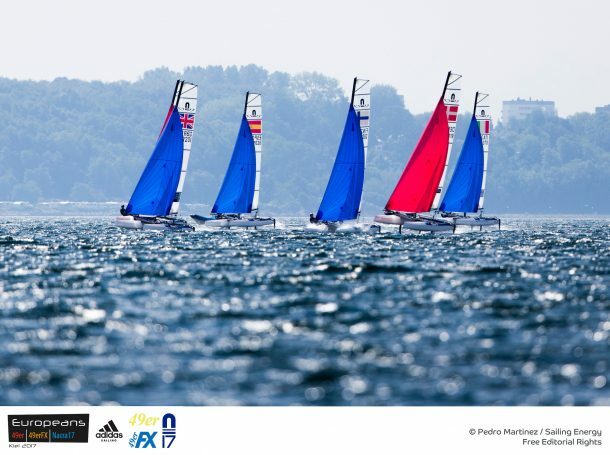 With the all-important Medal Race cutoff kicking in today for all three fleets at the 49er/49erFX/Nacra17 European Championship in Kiel, Germany, all pressure was on the ‘bubble’ teams to perform at their best. 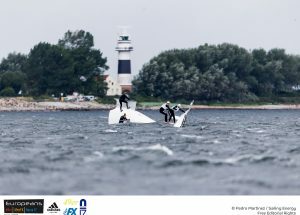 Some rose to the challenge, some quietly snuck in to the last spot, and many were left disappointed after a brutally hard day on the water that included a huge squall and winds from 6-18 knots. 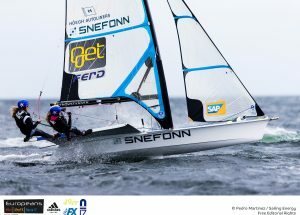 Gold fleet racing began for the Nacra 17 fleet under rainy skies and breeze into the mid teens, with Jason WATERHOUSE and Lisa DARMANIN showing the fleet just what upwind foiling means during the first race of the day. 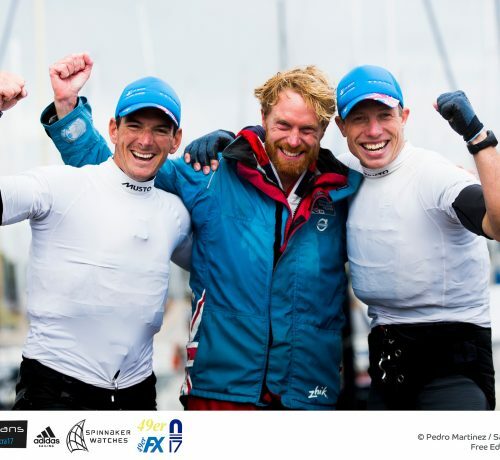 In his first day on the helm since the event began, the injured Waterhouse and crew Darmanin won the pin, put the bow down, and flew away from the fleet. 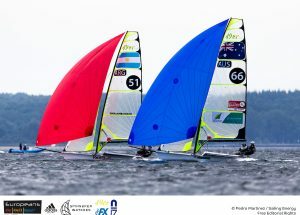 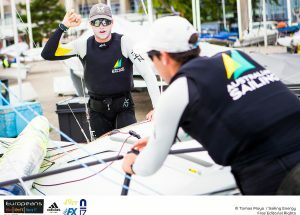 The Australian silver medalists crossed behind the first boat after tacking, sailing fast on the foils to the far right. When they came back in contact with the fleet, it became quickly apparent that the foiling mode had serious potential – at least in the 13-15 knot range. 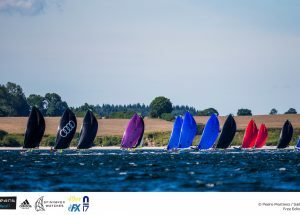 From 27th of July to 4th of August the Kieler Yacht-Club e.V. 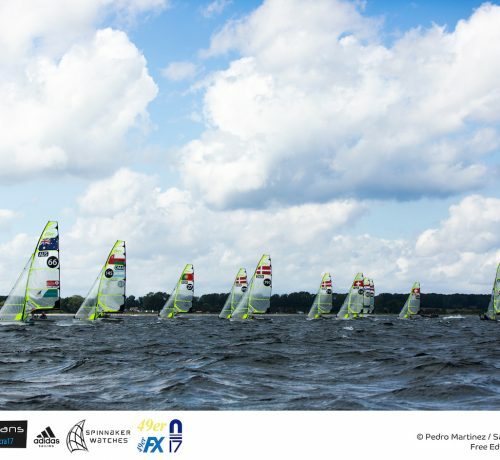 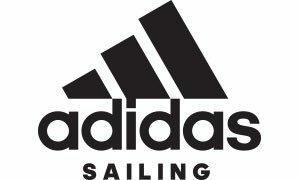 host the 49er, 49er FX and Nacra17 Mix European Championships. 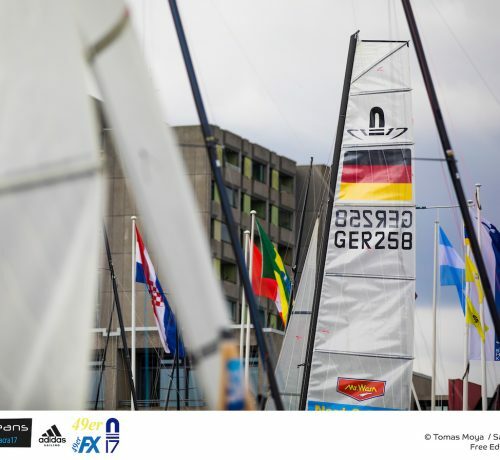 Around 400 sailors from 39 nations will meet in Kiel on their path towards Tokyo 2020. 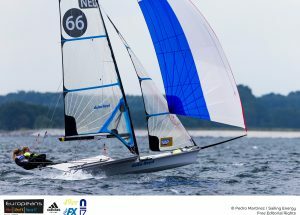 This time, the Nacra17 can for the first time show their ability “to fly” with the new foils in a regatta. 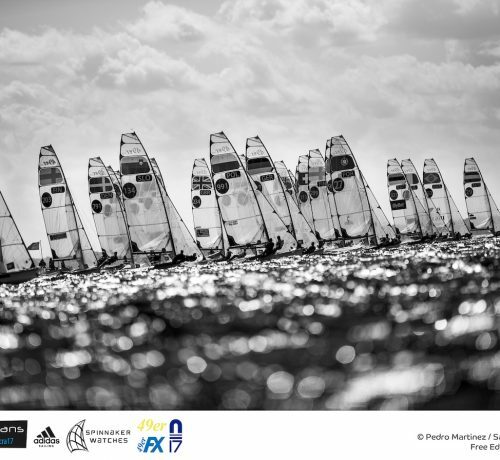 The narrowest margin at all for the Medal Race cutoff came in the ultra-competitive 49er fleet. 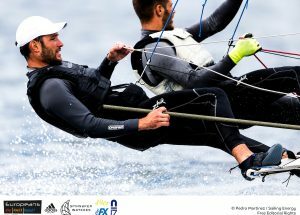 Spain’s Diego BOTIN and Iago LOPEZ-MARRA – bronze medalists in the 2016 Euros – overcame an uncharacteristically weak start to their event to claim the final spot on the board. 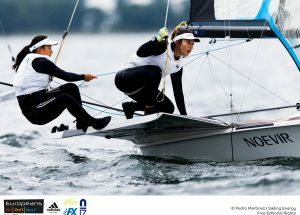 Their 0.5 point margin came despite ‘missing most of the shifts this week,” as Botin explains. 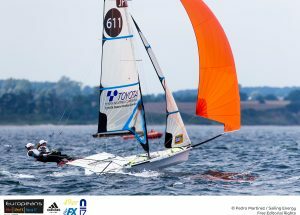 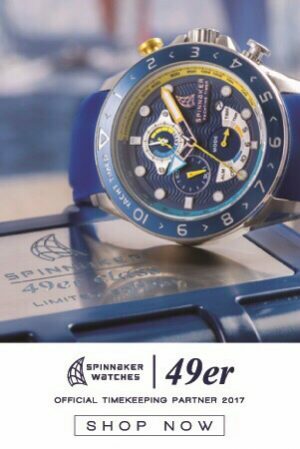 “We had real trouble reading the course here, and with racing so close in the Gold fleet, there’s no room for error in the 49er,” said Botin. 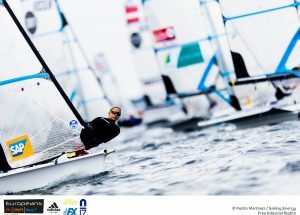 Crew Lopez said he’s excited to go up against the best in the world tomorrow. 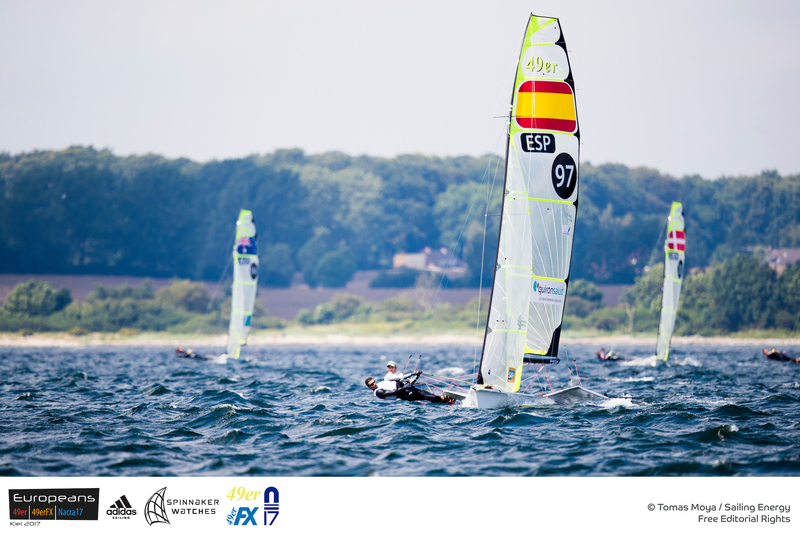 “It will be good to get back into the mix, and the short course racing is great training for Worlds later in the month, which has the same format.” You can listen to the young Spanish crew in their own words here. 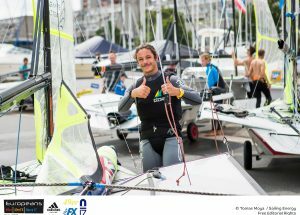 – August 4 will see us covering the finals. Each fleet will have 3 ‘theatre style’ races to determine the European Champions. 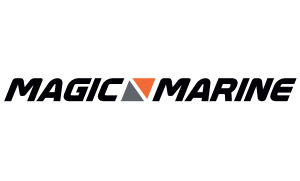 – Our live broadcast will have a drone camera, sideline camera, on board cameras, and a virtual environment. 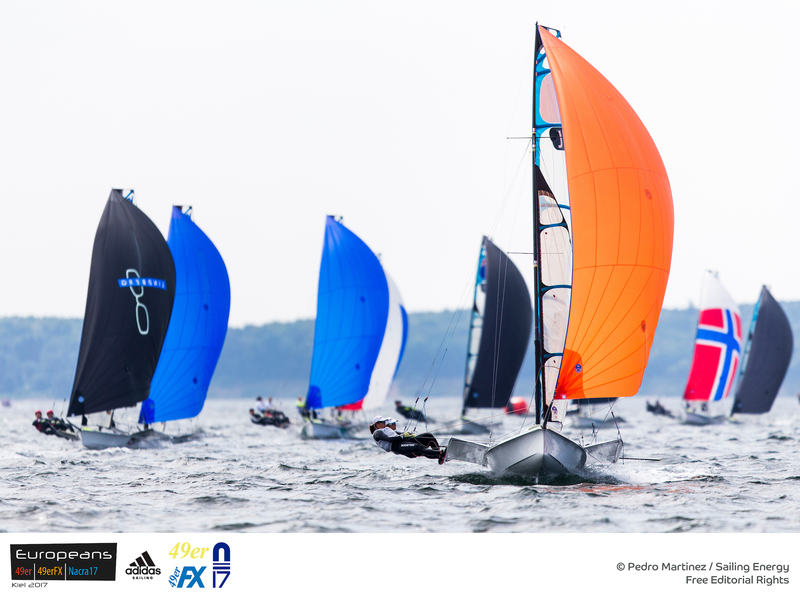 Combined with the best fleet racing our aim is to engage you with some spectacular, world-class sailing!